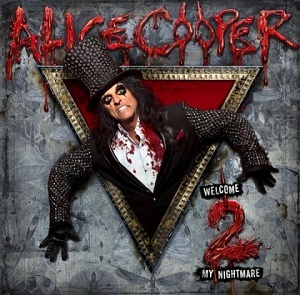 "Welcome 2 my nightmare" is the latest album from Rock legend Alice Cooper. The album is intended as a sequel to his 1975 hit album "Welcome to my nightmare". Musically its much more like "Welcome to my nightmare" than it is to his more recent albums. The album has cleverly incorporated themes from "Welcome to my nightmare" into this new album - a short piano refrain for instance. The album is incredibly diverse. While many bands try to incorporate a change of pace or two to add variety, Alice Cooper has produced a wide range of radically different sounds into the album, and yet still managed to tie them together to sound like they belong together - the nightmare concept helps in this respect. The album starts with "I am made of you", which immediately links us back to "Welcome to my nightmare" with its piano intro that ties in to the song "Steven" on the original album. "Caffeine" is the song most fans of Alice Coopers more recent albums are likely to enjoy most. Co-written with Keith Nelson from Buckcherry, this is a great rock song with plenty of pace and power. While the original "Welcome to my nightmare" had Vincent Price adding his voice to it, this time Alice Cooper has found another horror icon - Rob Zombie, who does the talking part in "The Congregation". A great rock song with a catchy chorus. "I'll bite your face off" is classic Alice Cooper hard rock. "Disco bloodbath boogie fever" is a track that features Rob Zombie's guitarist, John 5. If you're thinking that means its going to be a good hard rock song then think again - this is disco ! Imagine Disco meets the St Valentines day massacre and you've got an idea of what the song is about - the character is imagining killing everyone at a disco. It says a lot about Alice Cooper that he isnt afraid to do a 70's disco sounding song - this is a man who revels in shock after all. I have to say though that despite the disco nature of the sound I really like this song - its great fun, but I'm sure its going to divide opinions. "Ghouls gone wild" can be summed up quite easily - imagine the beach boys as Zombies. The song has that up-tempo pop sound that you'd associate with the Beach Boys, but mixed in with this is Alice Cooper's horror movie lyrics. "What baby wants" features pop star Ke$ha who plays the part of the devil. This track is likely to be the most contentious with its pop feel, but anyone who accuses Alice Cooper of selling out is missing the point - the man has always experimented with different styles over the last 30 years, but he still remains as a rock star - just one who isnt blinkered into limiting the breadth of his musical range. Slash used singer Fergie from the Black eyed peas, and as with Alice Cooper using Ke$ha for this song, proved that singers known for one style can still make a great rock singer. This is an album that really grows on you the more you listen to it. A fantastic album by a true rock legend.